HIKING, BIKING, FLOATING, FISHING!! NOW TAKING SUMMER RESERVATIONS! FABULOUS RATE IF YOU'RE LOOKING FOR LODGING FOR SUNDANCE FILM FESTIVAL!! MENS SKI TRIP? FAMILY REUNION? SKI CLUB? SUMMER GOLF? You've come to the right place if you are a large group looking for multiple units. We have THREE, four-bedroom, 4 bath town homes. Need More? We have friends and family with additional town homes on the same block! That's a total of 26 bedrooms we can offer you for your large groups!! All are located in Red Pine Complex, at the base of the Canyons Village Ski Resort. We are literally just minutes from the people mover, bus stops, and The Canyons Village Resort. Beautifully updated 4 bedroom,4 bath townhouse. Beautiful hickory cabinets, appliances, hardwood floors, tile, etc. The kitchen is stocked with basic spices, condiments in the frig, and all the kitchen gadgets and small appliances you could possible want. We have quality dishes, pots/pans, baking dishes, crock pot, griddle.......you name it. This is our second home and we have furnished it with everything we need. You will feel the comfort of a home, not a hotel. 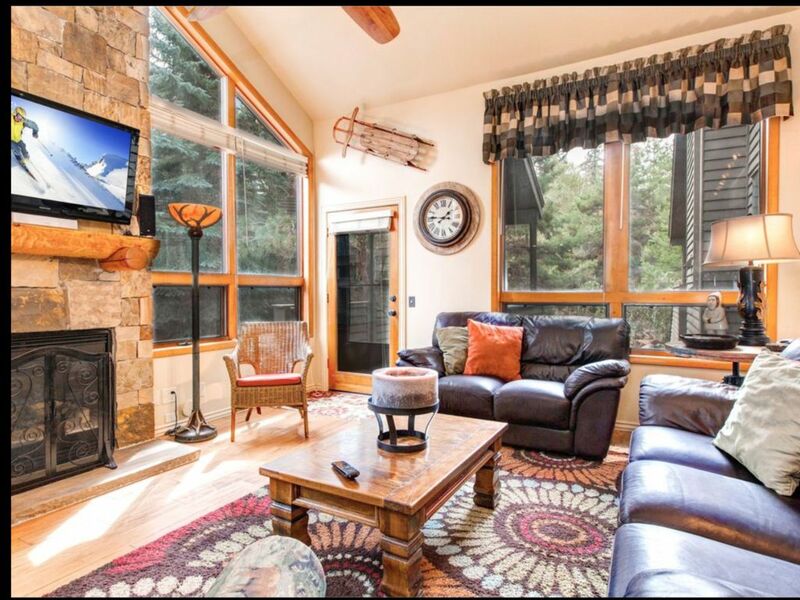 Nestled in the Wasatch Range of Utah and at the Base of the New Canyons Ski Resort, this comfortable, non-smoking townhouse is perfectly located for your winter ski trip, or summer vacations. With Tanger Outlet Mall just a couple of miles North, and Downtown Park City a couple of miles south, you must agree, this location is the best in the area. Deer Valley Ski Resort, and Park City Resort are also just minutes away. Of course, you can always stay close, ski the Canyons, and ride the Cabroilet right up to the base, and be on your way in just minutes. You will find this spacious townhouse to have all the luxury of home. Cable TV in three bedrooms and surround sound in the living room. We also offer free wireless internet service. The four beautifully furnished bedrooms are all updated with new linens, spreads, pillows, hair dryers, and accessories. Two bedroom suites are located downstairs, Both with a queen + twin. The master suite is upstairs, has a king bed and private bath. The main floor has a bunk room with a double over double bunk bed and private bath. For our SUMMER GUESTS, you will have a short walk to the clubhouse to enjoy the 2 large outdoor pools,(one is heated and open all winter!) children's pool, tennis courts, volleyball courts and picnic area. The two hot-tubs and saunna are available for guests all year long. We provide parking for 2 cars, one covered. The quiet complex is well maintained and secured. 50% need to hold reservation. The final 50% is due 45 days before arrival. Deposits on Cancellations less than 60 days in advance are non refundable. Cancellations made 60 days or more in advance will receive a full refund, less $300. CHECK OUT our other two town homes on vrbo.com. LISTING #'S, 50180, and 460233. We are from Tulsa, Ok and found Park City while traveling for business. My husband owns a stone quarry and I am retired from retail sales. We love outdoor activities and Park City offers such diversity. Skiing, hiking, biking, rafting and kayaking and much more. We had been skiing in Colorado for years until we visited Park City. Now it is the only place we ski and we truly love it! Our first attraction was how close it is to the airport. A 30 minute drive from Salt Lake City Airport puts you at our front door! Secondly, we have a large family and needed as many bedrooms/bathrooms as we could afford in one town home. We love the privacy of the 4 bedroom suites. No one shares a bathroom! Also, our clubhouse is awesome with 2 pools, 2 hot tubs, tennis courts, volley ball, and more. We have owned property at Red Pine for 15 years and have never wanted to look any where else. The location is amazing! You can walk to the cabriolet, the PC bus stop, or The Canyons Village Resort. We are only 4 miles to PC Resort, and just a couple of miles to the Outlet mall, Whole Foods, Redstone Shopping Center and wonderful restraurants! Each bedroom has a private bath. Walking distance to the cabriolet or The Canyons Village Resort The mountain view. So many trees in the back of the town home. When it snows it looks like an enchanted forest. Plush Linens, Bath soap, Body Lotion, Hand Soap and hair dryer in all bathrooms. Only 4 miles to downtown Park City. 5* Restaurants, Art Galleries, Egyptian Theatre, Boutiques and More! Park City Transit is a great option since parking is minimal. The Canyons Golf Course is walking distance from our townhouse. Parking for 2 cars. One covered, one slab. Both attached to the town home. You do not walk from a parking lot. In addition to quality bath towels we provide white towels to be used at the clubhouse. Large Fridge with bottom freezer & ice maker. Season starts with basic condiments for our guests. In addition our guests leave condiments, so it's advisable to see what is there before buying. Toaster and all other small appliances. Most condiments and spices provided. Beautiful oak cabinets, electric range, dishwasher, and large refrigerator with ice maker. We also provide a Crock Pot, Hand mixer, Blender, Mini chopper, and griddle. Large Flat Screen TV in Living Room Master and both Queen Suites have Flat Screen TV's. Bunk Room does not have a TV. LAWN CHAIRS PROVIDED FOR OUR SUMMER GUESTS. We reccomend High Country Adventures for rafting and kayaking. Small Deck with Gas Grill. CANYONS, PARK CITY, DEER VALLEY SKI RESORTS WITHIN MINUTES OF OUR TOWN HOME. BEAUTIFULLY NEW SURFACED TENNIS COURTS AT OUR CLUBHOUSE. Canyons Village Golf Course is now open. Walking distance from our town home. Park City area hosts numerous beautiful mountain courses. Due to the stairs we are not wheelchair accessible. Red Pine offers two outdoor full size swimming pools and one kiddie pool. Outdoor Pool is heated in the winter! Our Red Pine Clubhouse has two Hot Tubs and two large pools. One pool remains open and heated for the winter months. Private Balcony, 2 Hot Tubs at Clubhouse, 2 full size Pools at Clubhouse and 1 kiddie pool, beautiful new tennis courts, sanded volleyball court and sauna. Minutes from 3 major ski resorts, The Canyons, Park City Resort, and Deer Valley Resort. Only 45 minutes to Snowbird and Alta. 5 minutes to Olympic Park, down town Park City, snowmobiling, tubing, fine restaurants and more.